I have about 30 Fridays left as a New Yorker, which I plan on devoting to revisiting the neighborhoods and places I have loved in my 13 years as a New Yorker. Today, Thomas and I roamed the East Village, where I lived from 2005-2008. My East Village is the sorest of heartbreaks. It is feeling young, beautiful and free. It is learning whom I wasn’t as a writer. It is cigarettes and bourbon. It is making some fierce mistakes. It is the place where I took the girl I was and started to mold the woman I would become. Today, Thomas and I dropped Elise off at her East Village preschool on 14th Street and headed south without a plan. He was a little cranky and I just wanted to enjoy a Dec. 10th morning that didn’t require a jacket. I started reminiscing about the past. I eventually moved from the East Village to Williamsburg, partly because I paid an exorbitant amount for a tiny 5th floor walk-up, and partly because New York’s myriad nooks become haunted if you never leave; that corner is the last place I saw my second love, this apartment is where I wrote my first screenplay. But the beautiful thing, is you move away and come back, and it has changed, your ghosts have left because they can’t quite find where they lived now that the old bar is a dollar store and that one whole block is now a new condo development. I don’t begrudge the changes. I’ve always been good moving on from my ghosts. So where would I take the actual love of my life (along with his sister and his daddy), first? Abraço. 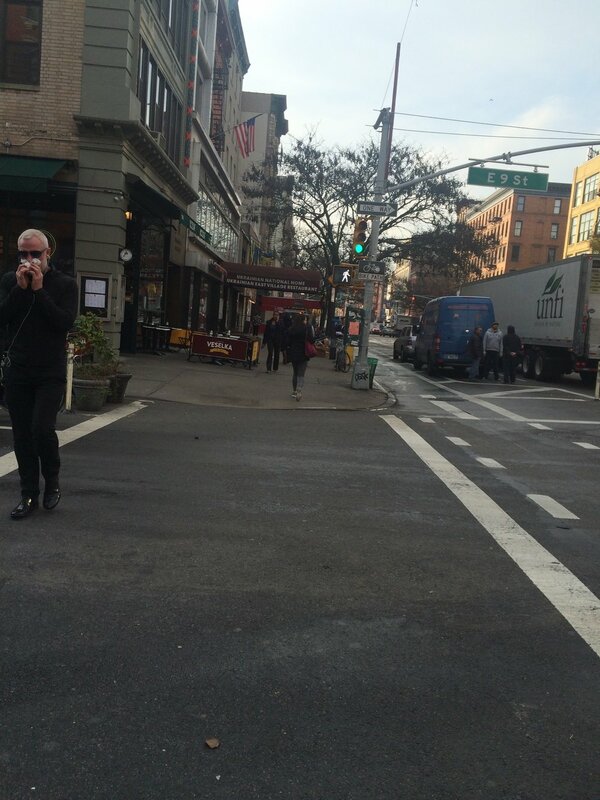 I was studying screenwriting at Brooklyn College when I first moved to E. 5th St. between 1st and 2nd Ave. These were very lean years, bartending and going to school. I usually made a French press coffee or occasionally picked up a $1 cup from a deli, though that was even a splurge. Abraço opened on E. 7th St., just around the corner from my apartment, and right away it had a big line out the door. One morning I decided to treat myself to a cappuccino and a slice of olive oil cake, standing at the little bar table outside with several other people, in the cold. It was the richest, boldest, creamiest cappuccino I’d ever had. And the olive oil cake was moist, buttery, and perfect with the coffee. I have thought of that, and a couple other perfect meals, over the years. Another was at Zucco the French Diner, a perfect soft-boiled egg with French bread soldiers and a swimming pool-sized bowl of cappuccino. The owner of Zucco passed away years ago and sadly, his little dinette is closed. But Abraço is still there. 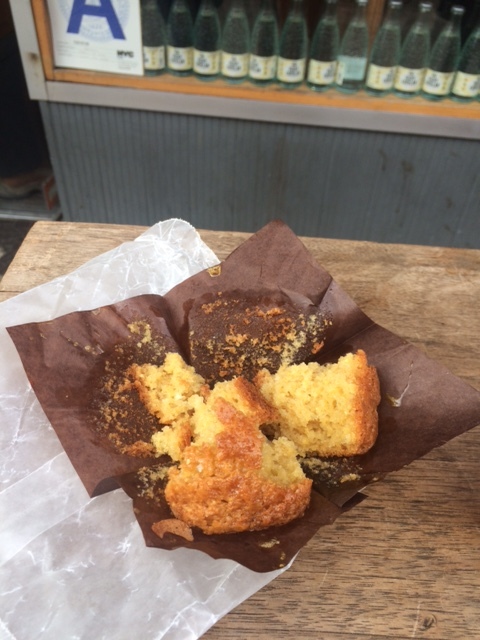 It was 9:30 a.m. so I skipped the olive oil cake and chose a salted honey corn muffing for T and I to share, along with that perfect cappuccino. The memory of some things can disappoint (like those early 20s boyfriends) but this did not. The staff and patrons were really tolerant of an energetic toddler, as well, giving him his own cup to play with and labelling it "cute" when he busted into the kitchen. 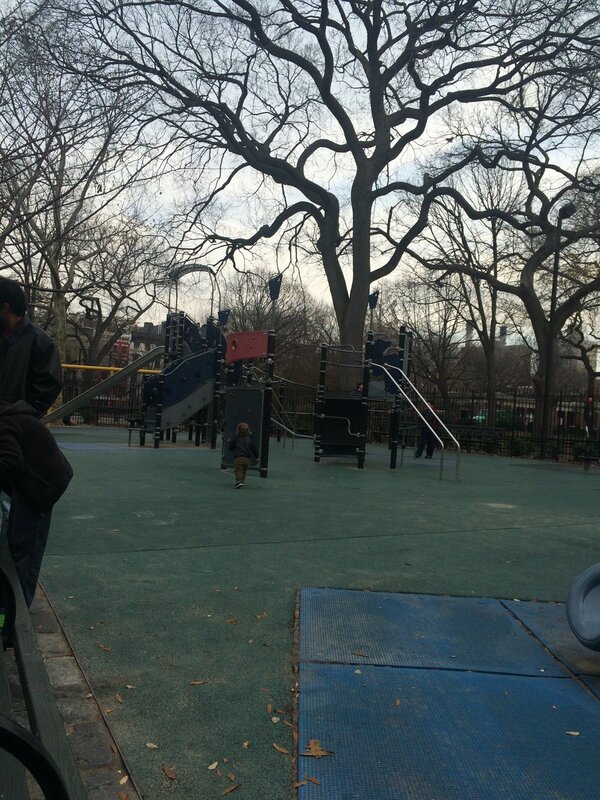 He needed to run, so we strolled by my old apartment and then up to Tompkins Square Park to play for awhile. I had a few more places to visit, but this life isn't that old East Village life and Little T needed a nap. So we said "Goodbye, East Village" and headed home.